While preparing my home (and life) to bring my daughter home I researched a crazy amount. I wanted to be prepared, but I also wanted to do things as naturally as possible. I stumbled upon cloth diapering several times. My initial thoughts were: "eew, what would I do with the poop?" "how could I find the time to do that in addition to everything else?" "how would I really know they are getting clean?" and so many more! The more I searched about it the more intimidated I became and it didn't take long for me to decide that it wasn't the route for me. 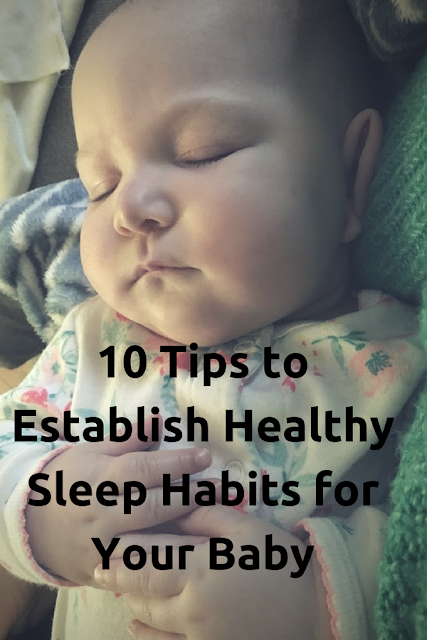 When my daughter was about 10 months, life was starting to become a little less chaotic, we were starting to get a good routine down, and I had finally started meeting other moms. I realized that there is a surprising amount of people that cloth diaper these days! After asking a lot of questions and learning more about the process it started to seem pretty manageable. 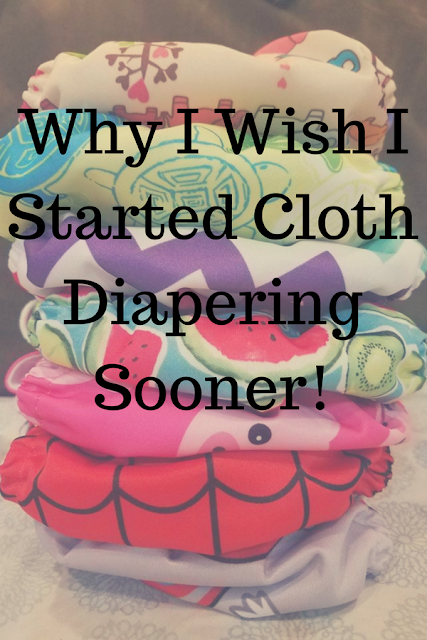 Plus, the more I learned the more reasons I found why cloth diapering is beneficial. Before we get to the tips, here are just some of the many benefits to choosing to cloth diaper. *Environmental: 16,000,000,000 diapers are thrown out in the U.S. each year! *Health: Cloth diapers are more gentle and make baby come in contact with less chemicals. *Financial: Not only do you save money by not having to continually buy disposable diapers, but you can also reuse them if you have more kids, and potentially sell them if they are still in good condition (or pass them along to another family). -As with everything to do with parenting, support is the key to success! I have several friends as well as a Facebook group (Fluff Love & CD Science) that I can go to when I have questions or concerns with my wash routine. My friend Kim Smith essentially sent me a step-by-step guide on how to get started and Kim and Brittany Lumley have both been available for answering my questions along the way which has been a lifesaver! Having this support is what inspired me to write this post in hope that it will make it a little less intimidating and more manageable for beginners! -Fluff Love University has been an incredible resource for me! It has an index for washing machines and laundry detergent to help you develop your wash routine. It's incredibly important to develop a successful wash routine in order to: extend the life of your diapers, make sure your diapers are getting clean, and avoid stink issues. It can be intimidating when you are first starting out to figure out how to wash your diapers, but Fluff Love makes it pretty simple. Plus, it's FREE! -Testing whether or not you have hard or soft water is an important step in developing your wash routine and knowing it can help you determine what (if anything) needs to be added to your load. -When you are first starting out it can be hard to pick what style diapers to go with. 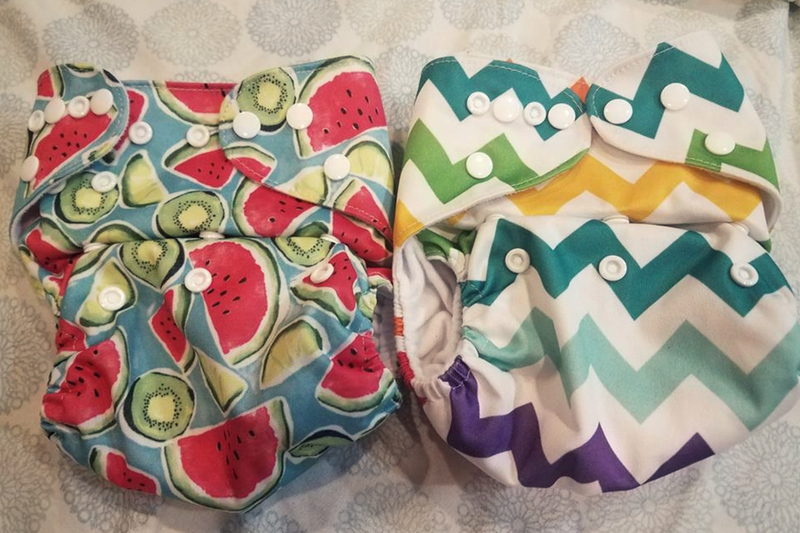 I will list some of the options below with a brief description, but we decided just to go with pocket diapers so those are the only style I have tried. of cotton. They are the cheapest, but must be used with a cover. -Fitteds: Usually made of cotton, bamboo, hemp, or fleece and are very absorbent. They do not require folding, but they do need to be used with a cover. 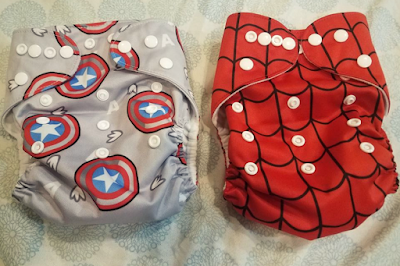 -Pockets: These do not need a cover or folding, but they do need to have absorbent layers stuffed into the pocket section of the diaper. 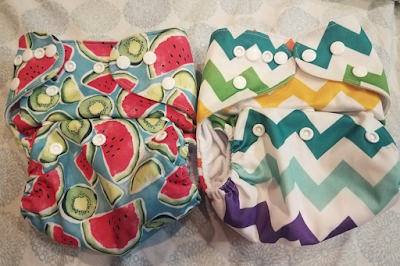 -All-in-Twos (AI2's): Similar to pockets except instead of stuffing inserts into a pocket, the absorbent layers are snapped inside the diaper. -All-in-Ones (AIO's): Require no extra work (stuffing, snapping, folding) and are ready to be used (just like a disposable), but are usually more expensive and can take longer to dry. 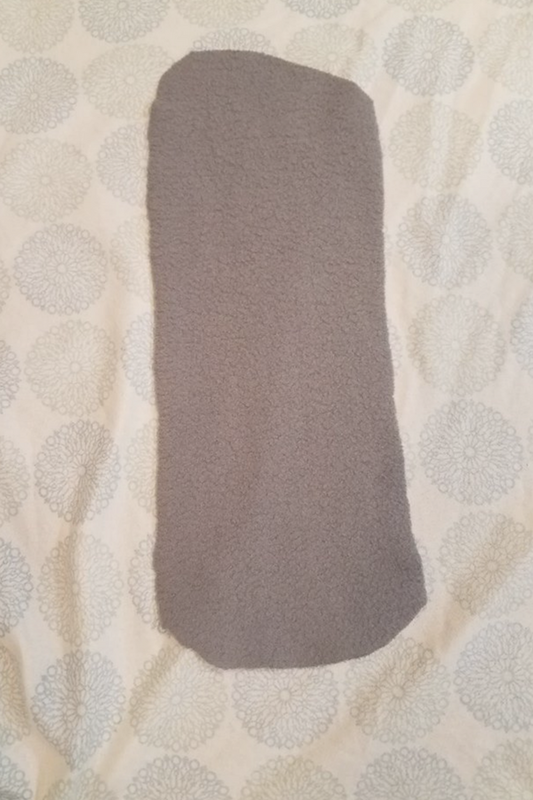 -Fleece liners can be easily made or bought. They make cleaning up poop easier because the poop slides off easier. And they help create a dry feeling for baby because it pulls the moisture away from the body into the insert. I made mine from cutting out strips from a fleece blanket from Wal-Mart that was only $2.50. The liner fills the entire inside of the diaper (I used an insert as a guide) and I was able to make about 30 from one blanket. It's a very forgiving project because it doesn't need to be perfect (as you can see below!) and since fleece doesn't fray there is no need to sew! Be sure to use micro-fleece, not polar fleece which would repel moisture and cause it to bead up rather than soaking through to the insert! -Some people use sprayers that you can attach right to the toilet and they are relatively inexpensive. We have a utility sink in the basement that doesn't get used for anything else so we make sure that all the solids are dumped into the toilet (wiped with a little toilet paper if necessary) and then we rinse the rest off before adding it to the wet bag. We started late in the game, but apparently if you have a baby that is exclusively breast fed (not eating ANY solids) their poop is water soluble and so you can add those diapers right into the washer without rinsing! -You'll want a couple at home hanging wet bags to put the dirty diapers in until wash day, we have two so that I can just throw one in the washer when I am doing a load and then have one to use on wash day. We also have several on the go wet bags for diaper changes when we are out. I like the ones from Alva Baby because they have two compartments so you can use one for clean diapers or even wet clothes or swim suits. -We had a lot of disposable wipes left when we started cloth diapering so we haven't switched over yet, but I have started a cloth wipe stash. We plan to use cloth wipes for pee diapers and still use the disposable for poop. They can be thrown in with the diaper laundry so it doesn't add any more work. -If you decide to go with pockets, I strongly suggest getting hemp or bamboo inserts. Microfiber is the least absorbent and tends to have compression leaks (also can't be used against the skin). Charcoal bamboo is really just microfiber between layers of bamboo so it's also typically not recommended, but we have had luck with them. -There are so many different fun patterns and it feels so good to know you are taking a big step towards creating less waste! **BONUS TIP**: If you're trying to get your husband/partner on board, pick out some patterns that they would like! This is a very basic overview of cloth diapering! My hope in making this post is that it will help to introduce you to cloth diapering without intimidating you. There is so much more to learn to so hop on over to the Fluff Love University website! Throughout my experience so far, I have been really surprised that I haven't really had to add more work to my daily routine and the benefits definitely out way any minor inconvenience. If you have any questions or have anything to add, please post in the comments below and don't forget to subscribe to keep up with my latest posts! I love to cook, but the truth is, now that I have a child I typically can't commit to a recipe that takes more than 30 minutes to make. I'm passionate about making homemade, healthy meals for my family, but it needs to be something that I can reasonably accomplish at the end of a busy day chasing around my daughter. 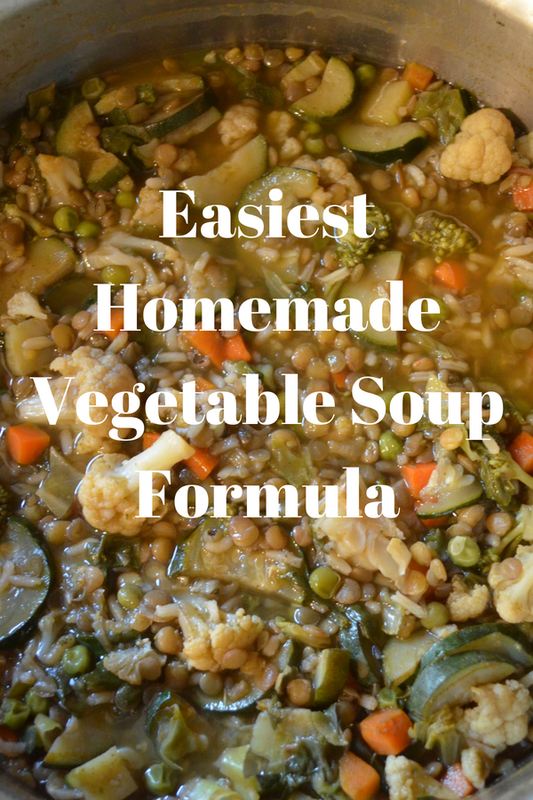 Homemade Vegetable Soup is one of my favorite meals to make because it's EASY, HEALTHY, and CHEAP! Plus, it's a great way to introduce kids (or picky adults!) to a lot of different foods or to get them to eat foods that they may otherwise refuse. This is more of a formula than a recipe because you can use whatever foods your family enjoys and/or the foods you happen to have on hand! If you don't like to measure ingredients, then this is the perfect soup for you! My absolute favorite way to make broth is adding Better Than Bouillon: Seasoned Vegetable Base paste to boiling water. Simple and so delicious! It also comes in many other flavors as well! Another option is just to buy already made broth from the store, such as: Pacific Foods Vegetable Broth. I prefer that one because it is made of only vegetables, seasonings, and water. Often times I will add beans to our soup (pinto, black, cannellini, chickpeas, etc.) if I have them on hand already cooked, but for those times when I don't already have beans prepped and ready to throw it I like to use lentils. The great thing about lentils is they don't need to be soaked (unlike most beans) and they have a relatively low cook time. When making a meatless meal it is important to make sure there is enough to it that you won't leave the meal feeling hungry. Protein is a good start, but here are some other options to add to help make the meal more hearty: quinoa, rice (wild rice is a delicious addition), pasta, or potatoes. There is just about an endless amount of options for this category, but I will include some of our favorites. Broccoli, zucchini, carrots, onions, garlic, peas, green beans, cauliflower, bell peppers, celery, sweet potato, spinach etc. Read ahead to the Steps section to find out important tips when using some of these vegetables! Another benefit to using the Better Than Bouillon paste is that you really don't need to add any seasoning, but feel free to add your favorites for added flavor. A few options: salt, pepper, garlic powder, italian seasoning, rosemary, etc. #1- Soften Vegetables: If you decide to use any of the following vegetables, I suggest putting a little butter or oil in the pot and add the vegetables in for a few minutes, stirring occasionally, until soft. I do this right in the big pot I plan to use for the soup, because, well, who needs more dishes to wash! Do this for: onions, raw carrots, garlic, celery, and bell peppers. If using potatoes, bake in the microwave in order to speed up cook time. If using spinach, add at the very end! #2- Add Broth: Now you'll want to either add in the broth or fill up your pot about 2/3 full with water and add in the Better than Bouillon paste. #3- Add Protein and Substance: Cook lentils, quinoa, pasta, and rice about 5-10 minutes less than package directions suggest. This will allow you to add in the rest of the ingredients without overcooking the protein and substance ingredients. #4- Add Vegetables and Seasoning: Simply add in the rest of the vegetables and cook until they have reached your desired tenderness. #5- Allow Soup to Cool and Serve! -Bread (if you're feeling ambitious homemade bread is delicious or store bought buns would work well too! Most Importantly It's Baby Approved!! If you enjoyed this post please share and don't forget to subscribe in order to get updates on all my new posts. Share in the comments below if you try out the recipe or if you have any requests for future posts! 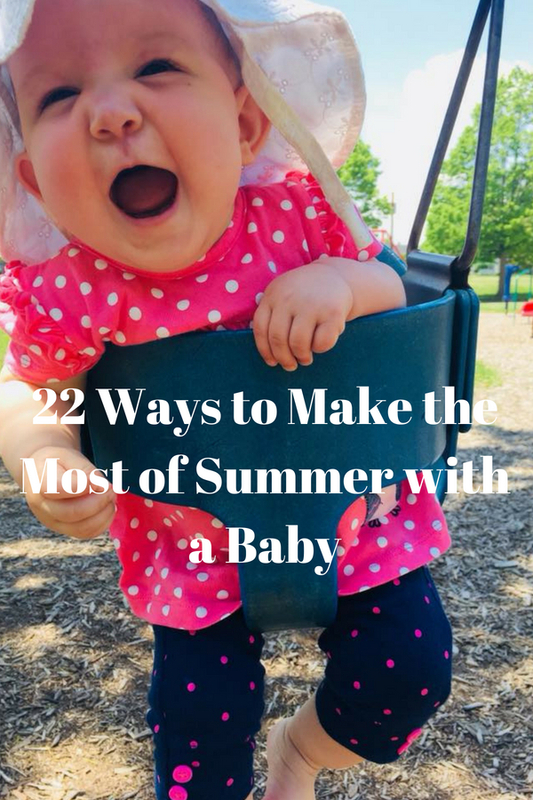 We only have so many summers to spend with our kids so let's make the most of it! Before we get started it's important to remember that every day doesn't need be Pinterest worthy or a big adventure. I think all mothers can agree that it can be so overwhelming to be constantly bombarded with all the things we should be doing with our children, but the reality is some days keeping the kids fed and loved is all we can do. So if you're having one of those days where you feel as though you just can't muster the energy to leave the house or prep an activity, please feel free to bookmark this post and come back on a day when you're ready for an adventure. 1.) Facebook Mom groups for your town are a great way to meet mom friends, ask questions, get suggestions, and plan play dates. 6.) Festivals- there are so many free festivals in summer! 7.) Farmer's Market- Lily loves people watching! 8.) Local Library- Most local libraries have story time, some also have a play space set up for kids, and if all else fails you can just go to pick out a few books. Reading is so important for babies and young children and it can be a lot easier to get them excited about it if it seems like a special treat to go pick out a book or read a new book. 9.) Museums- Depending where you live this may or may not be free, but even museums that cost money often times have discount days or free days. Kenosha Public Museum is free and although it's small there is still enough to entertain a baby. There is also a kids program called Museum Munchkins every Wednesday. 10.) Play Groups- Search online or ask in your local Facebook groups about where you can attend play group in your area. The KAC runs a program called Sprouts in Kenosha! Some hospitals run free play groups as well. 11.) Indoor Play Centers- There are versions of this all over, but our local favorite is Nest Playspace in Racine. 12.) Play dates can be so fun for your baby, but let's be real sometimes it's just nice to have another adult to talk to. 13.) Mom and Me Classes- Definitely not for everyone, but it can be really helpful to have scheduled activities to look forward to each week. Some examples: swim class, music class, etc. 14.) Support Groups- La Leche League, MOPS, hospital support groups, etc. the best part is that some of these can be online supports or in person whatever works best for you! 15.) Water Play- Use a shallow tote or baby pool and add a small amount of water at the bottom. Give baby some spoons, small bowls, bath toys, etc. Another option is to have several smaller containers with a little water in each so baby can dump them over and splash in them without having to be in the water. We like to do water play outside or in the bathtub! 16.) No Mess Painting- This is one of my favorites because it requires very little prep time, don't have to worry about baby eating the craft supplies, and it's fun. Squeeze a few dots of paint onto a piece of paper or tag board, put it into a ziplock and seal it up, and let baby go to town. 17.) Tugging Box- Poke a bunch of holes into a sturdy, small, cardboard box. Then cut a section of yarn (ribbons, lace, etc.) and tie it on both ends several times. You can also put a knot or two in the middle of the yarn in order to make it a little trickier to pull through. 18.) Velcro Board- There are so many possibilities for this one! Lily loves pictures of people so for hers I laminated some photos of her family. You could also print or cut out shapes, colors, letters, etc. and laminate them and add velcro. Hang up some fabric (just be sure that it's something that can stick to velcro like felt, fleece, etc.) or put the soft velcro up on the wall. You could also cover a piece of cardboard with fabric or velcro in order to make a portable version. 19.) Spider Web- Weave string or yarn through a laundry basket to look like a spider web, add some small toys at the bottom, and let baby explore and try to figure out how to get them out. 21.) Colored Ice- Another sensory play idea is to put a few drops of food coloring in each section of an ice tray and then fill each one with water. When they are frozen take them out and put a few into a shallow dish of water and let baby explore. It's fun to play with and then dyes the water once the ice has melted. 22.) Discovery Baskets- One of Lily's favorite activities is pulling everything out of a basket (or pulling all the books off the shelf). Sometimes I set her up with a basket full of objects she doesn't really get to see often and let her explore. One of her favorites is the basket full of all her headbands! Pinterest is full of a never ending stream of activities to do with little ones, but often times it can be so discouraging to search through a ton of activities, find something that sounds fun, prep it, and then realize that it isn't baby safe or is more work than it's worth. I love doing activities with my daughter, but I don't want to spend a lot of money or time preparing or cleaning up. If you're interested in this kind of post let me know and I'll be sure to do a trial run with a few more activities to share!